The dainty proportions of this diamond-detailed Zoe Chicco necklace make it perfect for becoming your signature piece. 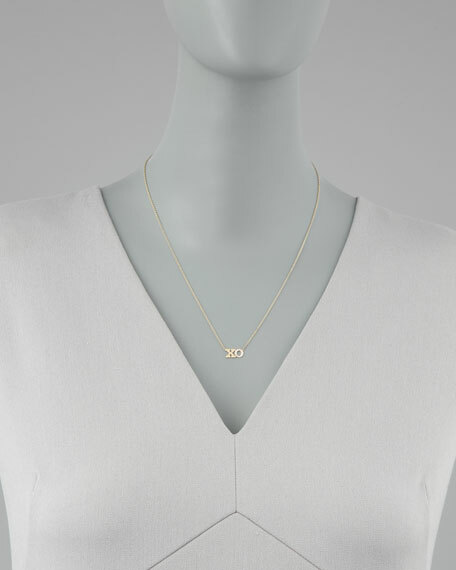 "XO" block pendant with pave diamond "O." .055 total diamond carat weight. Zoe Chicco, a trained goldsmith, launched her eponymous line of jewelry out of Los Angeles, California. Designed by Chicco and handcrafted with the help of artisans in LA studio, each piece expresses a unique edge. Delicately detailed 14-karat gold, oxidized sterling silver and diamonds shape Zoe Chicco earrings, rings, necklaces, and bracelets with a quality that transcends trend status. Mizuki necklace from the Sea of Beauty Collection. 14-karat yellow gold chain. Integrated naturally colored, black keshi freshwater pearl pendant. Mizuki necklace from the Sea of Beauty Collection. 14-karat yellow gold chain. Integrated naturally colored, black keshi freshwater pearl pendant. Bezel-set diamond detail. 0.03 total diamond carat weight. Lobster clasp with two length settings. Approx. 16-18"L. Made in USA.